Join us at Greenbank Farm for the return of the Holiday Market, featuring unique gifts and hand-crafted items from Whidbey artists and artisans! The Market will be open weekends December 8-9 and December 15-16. Market hours on Saturdays are 10 a.m. to 5 p.m.; Sundays 11 a.m. to 4 p.m. 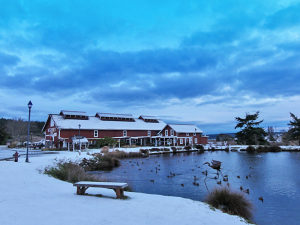 Hosted by the Port of Coupeville and Greenbank Farm businesses, you’ll enjoy shopping in our historic barn decked out in festive fashion–a perfect scene for holiday photos. Plus, don’t miss Santa’s grand arrival by fire engine on Saturday, December 8 at 4 p.m. to celebrate the farm’s traditional tractor lighting ceremony. He’ll be available each Saturday in December from noon to 2:30 p.m. and on Sundays during the market for children’s visits and photos. Vendors interested in renting a space can contact Hollie Swanson at 206.713.4798 or email hollie.swanson1567@gmail.com.